Halloumi fries are a great idea because how do you improve on the tasty snack that is fries? Make them out of cheese, of course! 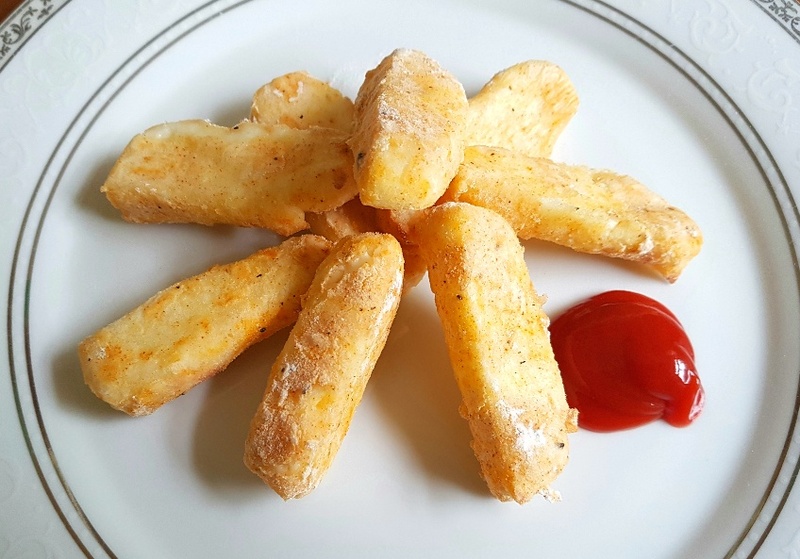 Joking aside, halloumi fries are seriously tasty and are an excellent side dish to serve alongside meals such as my Italian Beefburgers or Broccoli and Butter Bean BBQ Burgers. Halloumi is a firm cheese which originates from Cyprus and has a very high melting point. As a result, the beauty of halloumi is that it doesn’t melt when you cook it and it therefore holds its shape, making it ideal for crafting things like fries out of it. Halloumi is quite unique in that due to its firm texture it has a ‘squeaky’ aspect to it upon chewing. If you’ve never eaten halloumi before that probably sounds like quite an odd quality to the cheese, but trust me, it’s a really lovely cheese to eat. If you add a bit of salad on the side of these halloumi fries you could even have them as a main meal, if you like. It’s quite a salty form of cheese, so although I add ground black pepper to the fries coating I never add any salt because it’s simply not needed. If you’d like them to have a bit of a spice kick you can easily add 1/4 tsp of ground chilli powder to the flour coating. Another option is to use smoked paprika instead of sweet paprika because it will give the halloumi fries a smoky flavour. Halloumi fries take hardly any time at all to make, but they’re really rewarding in taste. The firm, creamy halloumi is coated in delicately seasoned gluten-free flour and upon baking they’re simply begging to have their crispy little selves dunked in good ketchup. Measure out 80g of halloumi and cut the halloumi into fry-shaped sticks. Mix the flour, black pepper and paprika together on a plate and then toss the halloumi sticks in it until they are fully coated. Place them on a baking tray and bake them in the oven until they are golden brown. Serve.